The peaceful village of Llanrhystud lies a short walk inland from the coast path, comfortably settled amidst flat fields, flanked by hills on either side. 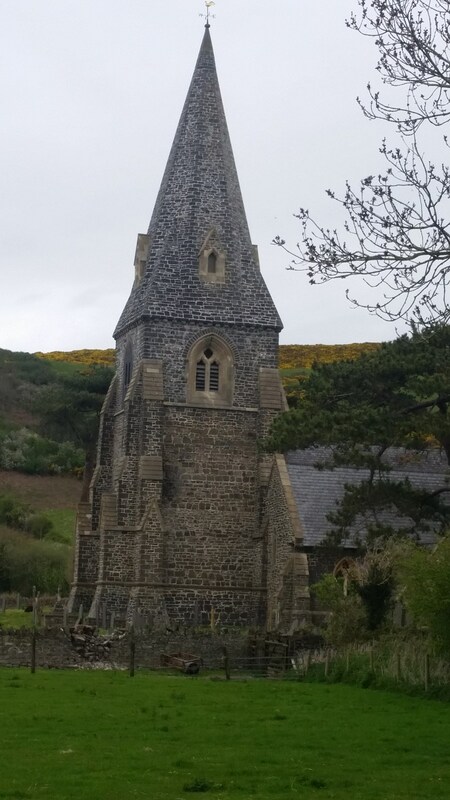 The most impressive building in the village is the Church of St Rhystud, built in 1852 on the site of an earlier, medieval church – the stone spire is unusual in Wales, where if churches have a spire at all, it is usually constructed from timber and slate. In days gone by the Red Lion pub and the Black Lion hotel faced each other in the centre of the village. The Red Lion is long gone but the Black Lion remains open for business and serves food lunchtime and evenings. There a couple of convenience stores here in what is the only break for accommodation and services between Aberystwyth and Aberaeron. As such its well placed and most walkers stay inland of the coast path for an unusual night at Penrhos Park home to the a golf club in a forest… which thankfully welcomes lonely walkers with good food and facilities including an onsite swimming pool, sauna and steam room!